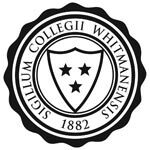 Whitman's logos, wordmarks, and its college seal should be used as described below. Other than resizing the marks proportionally for a particular use, you should use them without any alterations. If you have any questions about proper use, please contact the communications office. Whitman's clocktower logo, and the Whitman College wordmark, are primary identifiers for the college. Both the logo and wordmark may be used broadly for all types of communications. The Blues logos and wordmarks may only be used for athletic and spirit-related purposes; they should not be used for academic departments or programs. The college strives to present a consistent visual identity in all of our outward-facing communications. To ensure this consistency, we do not allow departments or programs to create logos or wordmarks that fall outside our visual identity system, or to alter our logos and wordmarks. This includes the Whitman College logos and wordmarks and the Blues logos and wordmarks. The only general exception to this rule is for departmental lockups, which consist of the Whitman logo or wordmark with the addition of the name of a department or program. These lockups are commonly used for stationery. If you need a lockup for your department or program or have any questions about this policy, please contact the communications office. The college seal is used in limited instances as the official imprimatur of the college. Appropriate uses include the college Constitution and by-laws and Baccalaureate, Convocation and Commencement materials, including diplomas. Do not use the college seal without prior approval from the communications office.